CSKA legend, Georgi Denev was fantastic dribbler an BTW very selfish player. Very talented with superb technique, he was together with Bonev one of the best midfielders in the world during the 70's. Denev played in midfield for CSKA but prefered to play on the left side. Therefore he was used in NT as a left winger whose runs created big damage to oponents. Winner of the title "Distinguished Master of Sport". Participated in the World Cup in 1974 in Germany (played in all three matches). Born on April 18, 1950 in Lovech. As a player competed in teams of local "Karpacheva (today Litex) (1965-1968), Spartak (Pleven) (1968-1969), CSKA (1969-1978)," Etnikos (Piraeus, Greece) in Cyprus and for the national team of Bulgaria played in 49 matches and scored 10 goals. He played also in 3 games with 1 goal for the "B" national team. In the Bulgarian first division collected 265 matches and 89 goals (237 games with 78 goals for CSKA and 28 games with 8 goals for Spartak Pl), Champion of Bulgaria in 1971, 1972, 1973, 1975 and 1976 and winner of the Bulgarian Cup in 1972, 1973 and 1974. In European tournaments he played for CSKA in 23 games and scored 3 goals (17 games with 3 goals and 6 European Cup games SSC). Ends VIF "Georgi Dimitrov". 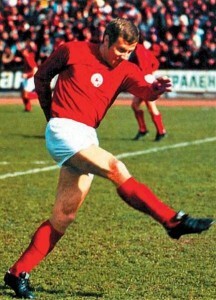 Denev is one of the legendary Bulgarian football players in the 70's of last century. He was characterized by good technique with a variety of dribbling, passing. Many foreign teams, including Real (Madrid) and Bayern (Munich), have declared their interest in him, but transfer was ruled out because of the ban on players at that time to go to clubs outside the country.As a coach leads the team of Lovech in the 1995/96 season when the team is in first league of Bulgaria, but failed to save them from relegation into lower division that year.